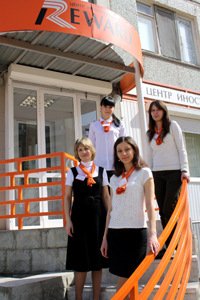 The Branch of REWARD Foreign Language Centre in the Krasnoarmeiskiy District is conveniently located in the heart of this district at 35 Engelsa Blvd. The Centre is situated in a beautiful comfortable office (opposite the caf? ‘Caffeine’) with the classrooms equipped with audio-visual equipment, as well as teaching and methodological resources. Classes are also held in the next building in the comfortable classrooms equipped with everything necessary for high-quality teaching. We offer classes in numerous foreign languages including: English, German, French, Spanish, Italian, Chinese and others. We invite adults, school-kids and children from 3 years of age to our courses. Classes are conducted by qualified and highly skilled foreign and local teachers, who have an excellent knowledge of foreign languages, are experienced in modern methods of teaching and who are enthusiastic about their work. We offer individual, group education in small groups (5-8 people), and premium groups (2-3 people). Our free of charge level test will help to determine your level of language skills and choose the best educational program for you, and our teachers will provide you not only with high quality training, but will also make the lessons really interesting, fascinating and informative. Our friendly and efficient managers are always ready to answer any questions you may have. Call: 98-62-20; 67-05-85.